You can take action with Actionbinary.com but I suggest it be to not use them. This is yet another affiliate marketing scheme aimed at nothing more than to get you, my binary trading brethren, to deposit your money and trade it away using random signals they provide. You may at first glance think that it is one of the more legitimate SSP’s on the internet but let me assure you it is not. You may think this because the home page and landing page for the signals proudly proclaim how the website and team provide quality trading signals with the potential to maximize profits with tips from their professional service. Adding to the illusion of this SSP’s legitimacy is the fact they are charging a fee for the service right up front with no hidden, or you would think, agenda. The fee is a smoke screen for the affiliate marketing aspect of the website and part of their two pronged attack. Not only do they want you to pay for the service, they also want to reap the rewards of your deposit. I will admit that at first I was not sure this was a scam or not. However, after only a breif review of the site I came to the quick conclusion it was a phony. Above and beyond the fact that it is an affiliate marketing sight it is not giving good signals. First, signals are delivered by email. This is a lagging method and may take more time to receive and be acted upon than the signal is good for. This is the first reason that will prevent you from profiting. Each day you will receive 5 or more signals from seasoned professionals. It is your responsibility to receive the signals, decide which ones you want to take, and then act upon them. This is your second opportunity to lose money. If you are randomly picking signals there is no way to be sure you are picking the good ones and the bad ones. I’ll give you that the signal providers are good traders. They are not perfect and will give a bad signal from time to time. In order to profit from their success rates you have to make all the trades that the trader makes. If you don’t you open yourself to unlimited loss potential. If you want to use signals or someone else experience there are much better ways to do it than this. Moving on from how bad the signal service itself is I examined the website itself a little more. What I found would only frustrate a serious trader. There is nothing but SEO article after SEO article. They are all about trading, there are a lot of them and they are organized well but there is no meat on the bone. There is no true information about indicators, technical analysis, strategy or trading. 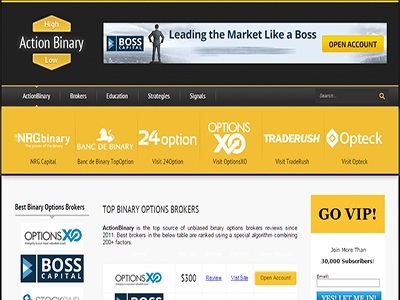 I found this to be true in the education section which was filled with little more than what you can find on most binary options brokers; this is a binary options, this is a call…DUH! I also found it to be true in the strategy section if not worse. Adding to the riduculous articles was a news update feed with posts more than 6 moths old. There are two benefits to this SSP but I must warn you, they aren’t great. First, you can get a free 7 day trial. Really 5 day probably because there will be a weekend in there somewhere. Of course, if you don’t already have a broker you will have to sign up with one and, how convenient, they have links to all the “best” brokers listed right there. And they even make it seem as if they don’t care which broker you choose, the service is good with any broker you would like. The thing they fail to mention is that not all brokers are the same. They don’t all have the same assets or expiry’s, a problem that could lead you to lose, even if using a good tip, or worse. It could prevent you from using the tips at all. In that case you may as well have just given your money to Actionbinary. There is one final reason, and I think the most compelling in this day of internet scams. Who the frick are these people?!?!? The website mentions the team of dedicated and professional traders but never gives a name, an address or a number. There is not one mention of the company behind the service, where it is locate or how to contact it. The only option you have is to register with the webpage. Oh, and when you register you get a “bonus”, no doubt paid for by your own deposits.